A photographer crouches in a lush green field in preparation to take a photograph of the gorgeous Tuscan countryside in the Province of Siena, in the Region of Tuscany, Italy. This area is known for its stunning beauty and scenic vistas. A photographer gets in position to set up a beautiful photograph of the lush green Tuscan countryside in the Province of Siena, in the Region of Tuscany, Italy. This region of the world is known for being beautiful and people come here from all over the world to see the countryside, but also to take pictures of the landscape. 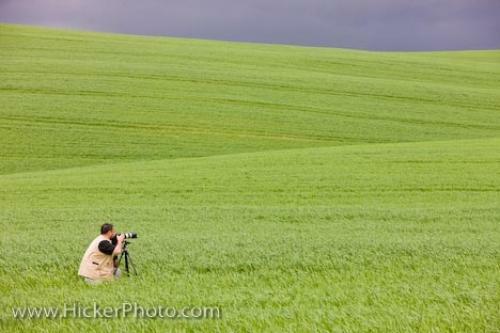 Photo of a photographer in the lush green Tuscan countryside, Province of Siena, Tuscany, Italy, Europe. Pictures from photo gallery "People Pictures"
This picture is part of the photo album "People Pictures" - there are more beautiful images waiting for you. Tuscany is about 22,990 square kilometres and has about 3.6 million inhabitants. It has many protected sites, such as the capital center of Florence, but it is known for its natural beauty above all else. A quick search on the internet will reveal the fact that Tuscany has so many hidden treasures, and uninterrupted fields of lush grass such as this is just one of them. Photographer in the lush green Tuscan countryside, Province of Siena, Region of Tuscany, Italy, Europe. I photographed this photo with the digital SLR camera model Canon EOS-1Ds Mark III, aperture of f/8.0, exposure time of 1/30 sec. on ISO 100, as always I used a original Canon Lens, the focus lenght for this picture was 130mm.